These downloadable/ printable cards come with a blank background so you can print on colored paper of your choice or a blush and terra cotta color scape to print on white paper. A few years ago our friends over at Cobalt and Dash created printable Thanksgiving cards. They could be sent in the mail or used on your Thanksgiving table as a place setting. This year they made another printable for us to share on our blog! Each downloadable sheet will be printed and cut into four place settings. We tried to follow a very seasonal theme. We have items like pie, bread, pumpkins, cranberries, turkey, fall leaves, etc showcased on these printable place settings. 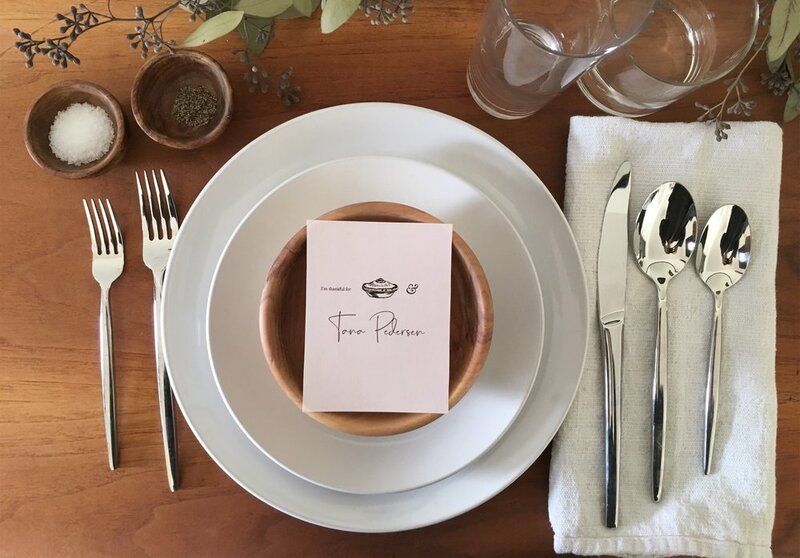 We hope these free downloadable/printable place settings can come in handy for your Thanksgiving dinner, or any time you just want to tell people you you’re as thankful for them as you are for pie! We all want to have a beautiful table setting for the holidays. And I’m pretty sure I’m not the only one that ALSO wants it to be easy and fast. We threw together this simple place setting using a linen table cloth, (I feel like linen gives me permission to leave the wrinkles! No ironing!) our everyday white dishes , one of our pinch pots, a sprig of oregano (that’s what we had leftovers of, I think it would look equally great with rosemary, thyme, or any herb to be honest!) and a simple piece of white printer paper with names printed on it and cut into 1 inch by 2.5 inch strips. Nothing fancy! But I think it looks warm and inviting, and smells great! Here is a link to the font we would have used if we had printer ink ;) I just wrote it these names out trying to mimic this style. Let us know if you try this out or something similar! Handmade wooden bowls, vases and accessories. A selection of just a few of our handmade wooden accessories that will be available for purchase soon! Our shop with hand made wooden bowls, vases, and accessories will open soon. We're getting so close to opening our shop. We have beautiful handmade wooden pieces that we're so excited to share with all of you. Keep checking back for shop updates! Feel free to contact us with inquiries if you just can't wait to place an order. Larry worked magic to rearrange my cabinets to give me space for a new diswasher! Larry built this custom closet to add storage (and some nice detail) into a small recessed area in the basement bedroom. I bought my first house in the Salt Lake City area in Utah last summer and knew right away I had some issues that I would need help fixing. I wanted to be able to take this from “a house” to “my home.” I would need some custom work done because most of what I wanted was tweaking existing cabinets and structures or fitting new storage into odd fitting places. A new, wood mantle with a mid-tone stain that would be true to the house being built in the 1950s. A custom built closet to add storage and a bit of architectural interest with clean lines in the basement bedroom. Custom, and attractive storage for both of the bathrooms. Larry Johnson was able to help me with all the items on my wishlist and I love how it all turned out. He came over, measured the house and listened to my concerns. He then went back to his workshop and drew up some designs for me to approve. Once the designs were approved I gave him a deposit and he went off to build his beautiful designs, which he then came back and installed. I absolutely love how it all turned out and I would absolutely use Larry for any of my woodworking or cabinetry needs again. Welcome to our new site! We are so excited to get our products and services out there on the internet. L. R. Johnson Cabinets is a provider of custom and pre-made cabinetry and handmade wooden decor, and other woodworking in Utah. We do work in Utah County, Salt Lake County, etc.